- Simply bolted four verticallegs to individual levels. - X-bracing attach to rack ends and rack is ready to accept drums. - Designed for convenient for klift entry from both front and rear. Our company has been successful in winning appreciation from the clients as one of the most prominent names in the trading of Double Drum Storage Racks. 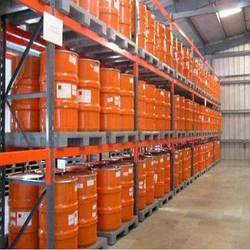 We put forth for our clients Drum Storage Racks that is manufactured using optimal quality material procured from reliable sources of the industry. These are designed to perfection under the expert supervision of our technocrats. Moreover, these are known for their sturdy construction, optimal quality and high performance. 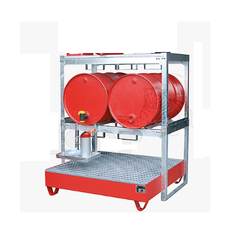 Available with us is a range of Drum Storage Racks and Dollies that is applicable in various industries and is offered at industry leading prices. High on durability and reliability, these can be custom-made as per the specifications provided by the clients. We are offering Drum Storage Rack to our clients.